Looking for luxury, glamor, world-famous beaches, and a little bit of wildlife? The Whitsundays and Hamilton Island can tick all those boxes. Check out this itinerary of cherry-picked attractions. Kick off your time in the area with a day cruise to Whitehaven Beach and Hamilton Island – aboard a large, high-speed and air-conditioned cruising catamaran. Because, let's face it, if you're heading to one of the world's best beaches and the Whitsunday's largest resort, you don't want to go low-rent! Spend some time on cosmopolitan Hamilton Island, the largest island resort in the South Pacific. It's full of pools, boutiques, galleries, bars, restaurants, walking trails, a wildlife gallery and more. 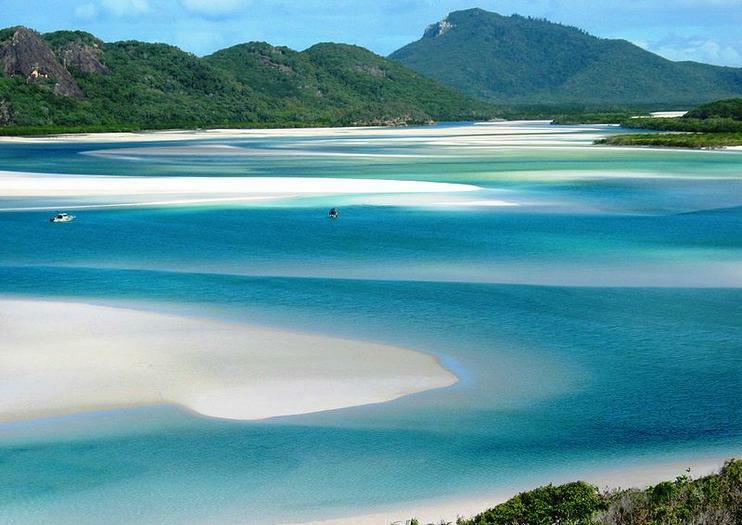 In the afternoon, hit the white silica sand of picturesque Whitehaven Beach. Renowned as one of the top ten beaches in the world, its shallows are graced by various species of turtles. Swim in the crystal clear waters, take a leisurely walk along the pristine beach, join in the beach games or just relax and soak up the sunshine. After a lovely day of resort relaxation, it's time to get into the wild on a Whitsunday Crocodile Safari. Travel by open-air tractor-drawn wagon-train through Goorganga wetlands then get your camera ready for croc-spotting on a calm water adventure cruise along the Proserpine River. Prefer Pirates of the Caribbean to Crocodile Dundee? Get on board for a Whitsunday Islands and Whitehaven Beach Sailing Adventure where you can sail through Australia's favorite maritime playground on one of the world's fastest commercial sailing catamarans. Stop to explore the spectacular Whitsunday Islands National Park or snorkel with the marine life at an inner-reef site. Why not finish up with some 24-carat luxury? As in a champagne picnic tour by helicopter? Oh yeah. Enjoy a bird's-eye view as you're whisked away to Whitehaven Beach. Relax as you sip champagne and enjoy a delicious picnic lunch while palm trees sway in the breeze and waves rustle on the shore. See the day out exploring islands at your leisure by ferry. Grab a Whitsunday Islands Hopper Pass so you can hop on and hop off as many times as you like between Airlie Beach, Daydream Island Resort and Long Island Resort. Explore the bush and estuaries of ‘wild Whitsunday’ on this full-day crocodile safari! Go croc-spotting on a Proserpine River cruise, and look for other wetlands wildlife on a tractor-pulled wagon tour. Take part in a Queensland mudcrab capture, and get a taste of bush life with traditional billy tea and damper. Feast on a fresh Aussie barbecue midday, and enjoy convenient hotel pickup and drop-off from Airlie Beach, Cannonvale or Proserpine. Spend two days and one night at the Great Barrier Reef, one of the world’s largest coral-reef systems. The Reefworld pontoon is your base for snorkeling, semi-submersible rides and other underwater explorations by day. Stay overnight at Reefsleep, located on the upper deck of the pontoon, 40 nautical miles (74 km) from shore and sleep under the stars in a swag (tent). Includes most meals and round-trip transport from the Port of Airlie or Hamilton Island. Start your Aussie vacation as soon as you land by pre-booking this convenient shared arrival transfer from Proserpine Airport (PPP). Meet your driver on arrival at the airport and travel directly to your Airlie Beach or Shute Harbor hotel in a comfortable, air-conditioned shuttle, with a maximum of 24 passengers. Save both time and money with either a one-way or round-trip transfer and maximize your time at the beach. Discover the natural wonders of the Whitsunday Islands on a full-day tall ship sailing cruise from Airlie Beach. Sail over the Coral Sea to drop anchor at Langford Reef and Bali Hai, where you can snorkel, swim and walk on the beach. Your tour includes a delicious assortment of gourmet treats served on board the boat, including morning tea, lunch and afternoon snacks, with alcoholic drinks available for purchase. Experience the beautiful Whitsundays Passage — part of the Great Barrier Reef — with no more than 40 participants, ensuring a more intimate trip. Skip the hassle and expense of finding a taxi to the airport by pre-booking a shared minicoach transfer from your Airlie Beach or Shute Harbour hotel to Proserpine Airport (PPP). Relax and let your professional driver provide efficient and reliable transportation to your flight, ending your vacation of business trip on the right note.